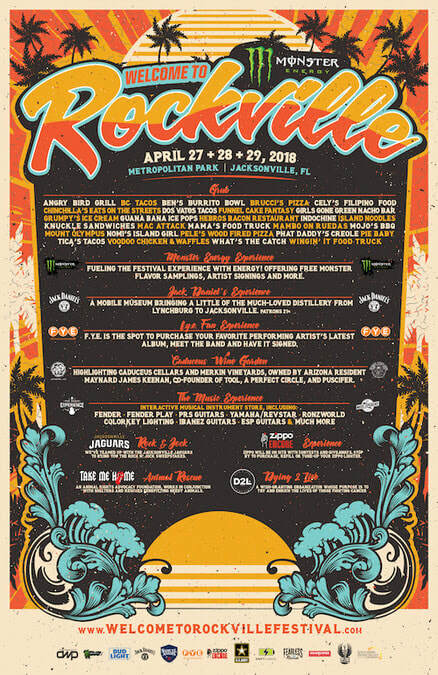 ﻿Published by Sareth Ney on March 7, 2018 at 10:07 p.m.
JACKSONVILLE, Fla. – Monster Energy Welcome To Rockville announced the experiences taking place at Metropolitan Park, from April 27 through April 29. Southern Hospitality Concessions LLC, Grub Zone, will be on site. Other food options include: Mojo’s BBQ, Pele’s Wood Fired Pizza, Indochine Thai Cuisine, Island Noodles, Guana Bana Ice Pops, Brucci’s Pizza, Cely’s Philippine Cuisine, Knuckle Sandwiches, Grumpy’s Homemade Ice Cream, Dos Vatos Tacos, What’s The Catch Fish Tacos, Chinchilla Eatz on the Streets, Mambo on Ruedas Cuban, Wingin It, Cousins Maine Lobster, BC Tacos, Mama’s Greek Cuisine Food Truck and more. Those 21 and older can enjoy beverages provided by: Caduceus Cellars & Merkin Vineyards Wine Garden, Heavy Tiki Bar, Mrkt N Jolt, Bud Light, Samuel Adams Sam ’76 and Jack Daniels. f.y.e., Zippo, SWFTCharge, The Music Experience and The Student Exchange, Fearless Records Experience, Fxck Cancer/Dyin 2 Live, Take Me Home, Love Hope Strength and Jacksonville Jaguars’ Rockville VIP Rock N Jock Experience with Stone Temple Pilots VIP meet and greet will be present. The latter also comes with a VIP experience at a 2018/2019 Jacksonville Jaguars game of their choice (subject to blackout dates/playoffs). For more details, visit: http://www.jaguars.com/rockville/. 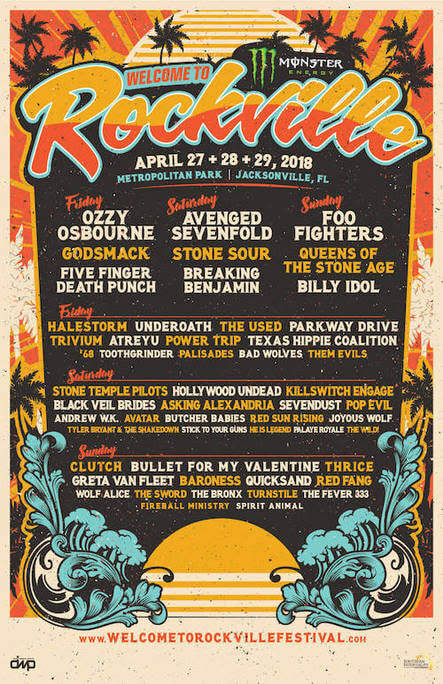 Friday, April 27: Ozzy Osbourne, Godsmack, Five Finger Death Punch, Halestorm, The Used, Parkway Drive, Underoath, Trivium, Atreyu, Power Trip, Texas Hippie Coalition, ‘68, Toothgrinder, Palisades, While She Sleeps, Bad Wolves and Them Evils. Saturday, April 28: Avenged Sevenfold, Stone Sour, Breaking Benjamin, Stone Temple Pilots, Hollywood Undead, Killswitch Engage, Black Veil Brides, Asking Alexandria, Sevendust, Pop Evil, Andrew W.K., Avatar, Butcher Babies, Red Sun Rising, Joyous Wolf, Tyler Bryant & The Shakedown, He Is Legend, Stick To Your Guns, Palaye Royale and The Wild! Sunday, April 29: Foo Fighters, Queens of the Stone Age, Billy Idol, Clutch, Bullet For My Valentine, Thrice, Greta Van Fleet, Baroness, Quicksand, Red Fang, Wolf Alice, The Sword, The Bronx, Turnstile, The Fever 333, Fireball Ministry and Spirit Animal. Additional sponsors are: Bud Light, North Florida Sales Distribution, Samuel Adams, f.y.e., Jack Daniel’s, Zippo, SWFTCharge, The Music Experience, The Student Experience, US Army, Fearless Records, Roadrunner Records, Fxck Cancer/Dyin 2 Live, Take Me Home, Love Hope Strength, Jacksonville Jaguars, and Southern Hospitality Concessions LLC. Tickets to attend and camping options are available at www.WelcomeToRockvilleFestival.com. Active military general admission ticket discounts are available at www.govx.com.